BGG classifies The Golden City, a Michael Schacht design, as an area control/area influence, auction/bidding, and route/network building game. I’d throw in set collection as well. 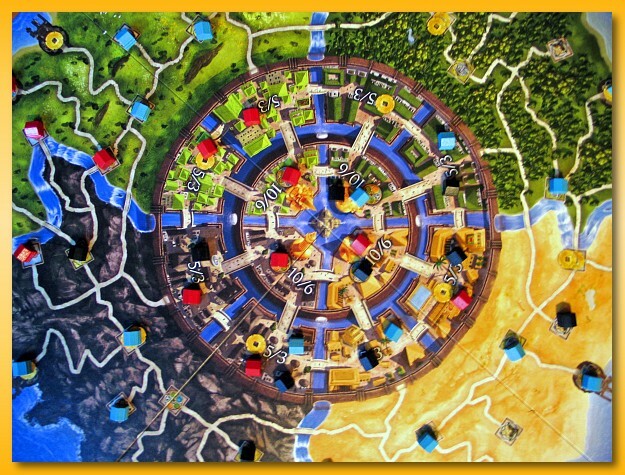 Three to four players attempt to build connected networks of wooden buildings across the four terrain types that lead to the Golden City at the center. Outside the outer city walls, each terrain type (desert, mountain, grassland, forest) comprises ports and a network of pathways connecting villages that eventually lead to the city walls that form a circle of 12 segments (3 of each terrain type). The rural areas are separated from one another by rivers that also leads to the city’s center. Inside the walls and within each pie shaped quadrant of the city there exist three segments of the city: two outer segments and one inner segment. City segments are connected by bridges. Players begin their journey to the Golden City at the ports, building businesses (placing wooden bits) in the connected villages along the pathways outside the city. Eventually, players enter the walls of the city and hopefully make their way into the center of the city. Along the way, players earn “letters” (victory points) and the player who earns the most by game end is declared the winner. Play is relatively straightforward. Each round, a deck of “landscape” cards, depicting terrain types and ports are drawn and placed face-up (equalling twice the number of players in two columns). Players place “hands” on pairs of cards indicating a desire to take those two cards. Subsequent players may either place their hand on an unclaimed pair of cards or kick someone off at a cost that increases every time it’s done within the round. In essence, players bid on pairs of cards and eventually all of the pairs are claimed, the bids paid, and the cards allocated to the players hands. In turn order (always clockwise), players build zero, one, or two businesses (place wooden bits) onto the board. To place a bit on a port, the player must play a single port card. To place a bit in a rural area or in one of the two outer segments of a city, the player must play two matching landscape cards that depict the appropriate terrain type of where the building is being built. Two matching terrain cards can be played as a single wild card for any desired terrain type. When building a building, the only restriction is that you must be able to traverse the pathways to a neighboring village or city segment where you’ve already built a building. Ports and rural villages can only contain one building. City segments can contain multiple buildings but only one of each color. All building locations come with a bonus for the builder that takes the form of an extra landscape card, money, bonus cards, keys, or goods. Players build their network of buildings towards the city center but sometimes branch out to gain the favors represented by the individual building locations. The key favors are especially critical in that when one gains a key, it allows them to unlock one of the cities central segments for placement of a building. The key is good for one use and given that the game only contains 6 keys, they’re a highly contested item for players trying to gain the big rewards of building in the city center. After all players build (or opt not to), a scoring round occurs. An individual scoring card (flipped up each round) determines two fixed scoring goals for the round granting “letters” (victory points) to those players who have managed to obtain a matching goods card, have built along a river that separates the rural segments, or have built in the specified city segment. An additional bonus deck of cards allows players (when building in the appropriate villages) to obtain end-game scoring letter bonuses for building in specific locations or acquiring specific items of interest (e.g. goods). In my opinion, The Golden City is a simplified form of an earlier Schacht title China which was itself a simplified form of an even earlier Schacht title Web of Power. The Golden city throws in the auction mechanic and the simplified but more varied scoring opportunities for the delicious tension provided by the end game scoring in China. The ability to block access to keys seems relatively easy and unbalanced. Although the 10 letter swing in points gained by being the first in the city’s inner segment may not make or break the game it is a significant swing in points. Landscape card play is identical to China but there is no penalty for “opening” a new region. In fact, The Golden City makes it even easier to start a new network of buildings by requiring only a single port card to establish a “disconnected” presence in a terrain type. The flipping of the “score” cards each round do provide short-term goals but in many situations it’s very difficult to do anything about them given that it can take several turns to build up to some goal. It might make more sense to introduce a house rule similar to Kreta or Dos Rios where multiple cards are visible each round and you can plan on building presence towards an eventual scoring N rounds from now. There is an official two-player variant provided by Michael Schacht that I have yet to try but it seems that game would work best with four. With three there doesn’t seem to be enough competition for rural land spots as well as less competition for the auctioned cards. Looking forward to more plays to see if my hunches proves correct or not. I like The Golden City and, as I said, I’m looking forward to more plays. It definitely is a fairly simple gateway-style family game that’s easily picked up by even those that don’t play games that often. Given this position in my collection, I’m targeting it for a group of couples that gather at our house once a month and for a opener/filler for my more meatier gaming group. Unfortunately it only goes to four players so it might not see the table as often as I’d like. Due to the pressures of life, I was only able to commit one day to Origins this year but I had a great time. I didn’t spend a lot of time playing games but instead spent the time in the exhibit hall talking to people and looking at the current state of the gaming community. I arrived at the Columbus Convention Center about 10:15 on Friday June 25th. I had intended to arrive a bit earlier but on my way downtown, while waiting at a light, my position in line allowed for a front row seat for a relatively horrific two-car accident that left the two drivers unhurt but shaken and lots of debris, fluid, air bags, glass, and pretty much the front half of one car in the roadway. It’s been a few years since I’ve been to Origins but I must say that they’ve remained consistent in their level of confusion. I think they would do well to hire somebody to organize the visual aspects of the event or fire the person they’ve been using. Don’t even get me started about the web site. Yes, it was better this year than last but it stands as a testament to confusion. I’d wanted a single $5 Exhibit Hall Day Pass and arrived to see several lines at “booths” clearly marked Registration as well as a single long line at what appeared a coat check booth with an Origins Logo projected onto the wall above and numerous paper signs taped over the opening; all of the them drooped over occluding the text describing the purpose for the line. I could hear many around me asking what line they were supposed to be in. On close inspection the droopy paper signs, printed one large block word per sheet of paper read something like “Exhibit”, “Pass”, “And”, “?”, “Event”, “Regist”, “ration”. Even if I could read the “?” sign I still might not understand that the “One Day Pass”, as stated on the web site, was the same as the item described as the “Exhibit Pass”. Luckily, my hunch was right and after paying my $5 and getting a paper wrist-band I was on my way through the doors and into the melee of the Exhibit Hall. Front and center in the hall were the Mayfair, Rio Grande Games, and Queen booths. Mayfair’s booth was clearly marked and gigantic. The play tables were filled throughout the entire day. Somewhat tucked around the back but still clearly visible was the RGG booth which sported a small but functional area for purchasing games and a dozen or so tables for playing games. They had copies of Assyria, Egizia, Macao, Albion, etc. for playing but I was only lucky enough to slip in on the first 2/3 of a game of Assyria. I checked back regularly but was never able to find an open spot. 15 minutes before the closing of the hall, I was able to get a shortened demo of Albion. Seemed like a relatively simple game of putting crap on a board to gain stuff with a bit of schadenfreude thrown in to dice it up. The demo “docent” kept stressing that he thought the game was mis-themed (a space theme would have worked better) and that the game was relatively deterministic 4 or 5 turns from the end. On the other side of the Mayfair booth was the Queen Games booth which, in my opinion, was not well marked. I’d received an email about finding time to meet Rajive Gupta, the CEO and boy is he a hard man to track down. I hovered around the booth off and on for over an hour but finally caught him when he stood still for once and was able to have a nice chat. I’d love to get my hands on a copies of Fresco and Samarkand: Routes to Riches for review. Near the back of the Queen booth was a manufacturer that specialized in fancy gaming tables. The one shown above was listed at some 20k USD so I’m sure they sold out of all 1000 copies they brought 🙂 They did however have a pretty neat coffee table that made my woodworking juices start flowing a bit. If I only had more hours in my day to play. I snuck down to the CABS Board Room and although I didn’t have a ribbon, George let me sneak in for a few shots and for a shot of the stack of over 100 copies of Wallenstein that Queen donated. Given all the give aways and the free food that Rio Grande Games was giving away I wish I’d could have spent more time and been able to focus on the Board Room. Unfortunately I wanted to check out the miniatures. I’m not a miniature player but my middle school summers were almost completely taken up by camping out in a friend’s rec-room where we build plaster of paris mountains and glued on grass and trees for a realistic setting for his trains. You can do a lot with 2 4×8 sheets of plywood, let me tell you. The miniature hall brings back lots of memories and I can appreciate the work that goes into building those dioramas. I did get to see a bit of the Gettysburg Soldier battle that took place in the evening and talk to the guy that was running the game. Very cool stuff. Over the years, Michael Schacht, a relatively well known German board game designer, and I have gotten to know each other fairly well via email and BGG “geekmail” and we’re currently embarking on a business relationship for an earlier game of his for the iPhone platform. Too bad we live on opposite sides of the planet; I’d love to meet him in person. In the meantime, I’ve gotten a bit of air time on his website. Use the rolodex under the book to jump to the “M”s. June, 2010’s installment of Analog Game Night has, sadly, come and gone. We originally had eight but a couple of the guys had some late-breaking family items to attend to so we ended up with six. We started out the night with a six-player game of Medici. I must say that Medici is starting to become my go-to game for a shorter, but meatier, 6-player game. It can be a bit mathy that I think some of the players in my group really like but if my win/loss ratio is any indication, you can be successful playing by your gut. Medici is a relatively theme-less auction/set-collection game of drawing goods tiles blindly from a bag and auctioning them off to place in bays on ships. When all the goods are sold, everybody ships the goods they purchased in hopes of converting those goods into the highest profit. Players generally must focus on buying and shipping specific goods to maximize profits. Because of this, the auctioned lots of goods have differing values to different players and therefore players must evaluated the end value of the goods once shipped to understand what they’re worth in the auction. Of course filling your ship with goods takes several auctions so the value of any particular lot is a bit difficult to predict since your cannot predict what other lots you’ll be able to purchase (and what others have purchased) in subsequent auctions that affect your return on your investment. All players start with the same amount of money and the player with the most money at the end wins. We just think of the money as victory points since you use a little wooden goods bag on the board to indicate how much money you have. It could just as easily been victory points. Winning an auction requires you to move your money indicator back on the track and when you deliver the goods, your money indicator goes up; essentially victory points. The game is a Knizia so, as you’d expect, the mathematical underpinnings of the game are rock solid, the rules are clean, and the game although good, may be a bit dry and the mechanics easily detached from the theme. 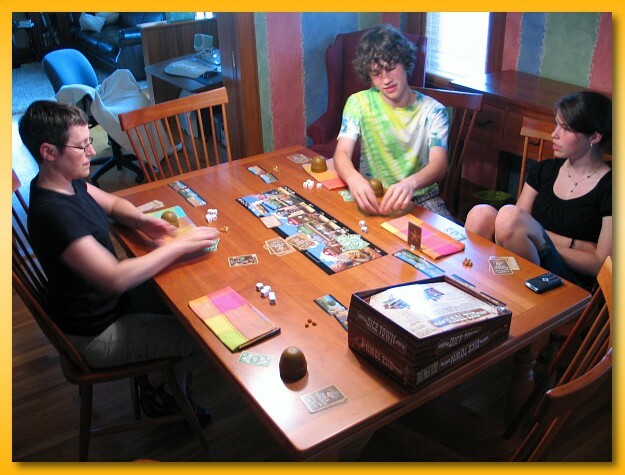 We split up for the next round of games with three of us in the kitchen and Bob kept two others in the dining room. 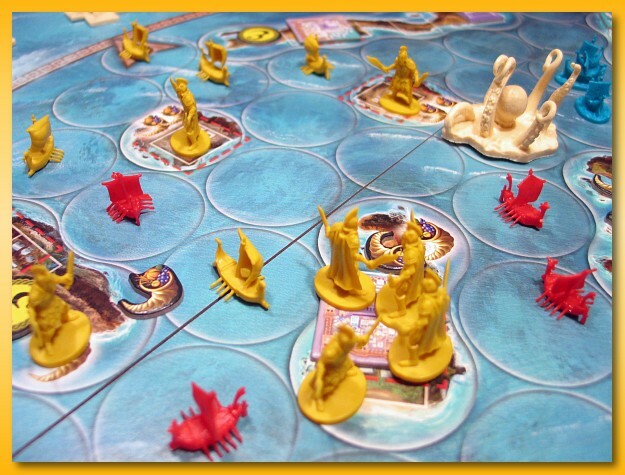 The dining room pulled out a very cool looking game, Cyclades. I must say, the game looks awesome and I wish I would have been able to play. It was Bob’s first attempt at teaching the game (and playing it) so I think it went rather slowly with lots of rulebook checks etc. However, that’s to be expected. Although our competitive juices still start flowing, winning and losing really takes a back seat to just exploring the mechanics, the bits, the cause and effect of different moves, understanding the high-level and course-grained cause and effects of play, etc. I wish we had a large enough block of time sometimes that when we learn a game that we’d play it…and then immediately play it again to help solidify what we learned and to step into the realm of fun that only occurs when you can explore the finer-grained nuances of the game. At my table, I finally got to pull off the shrink and teach the game of Hansa Teutonica. I’d only played the game once, in November of 2009, in a five-player nightmare. In that game, I came in last by a mile and wished I could have played again immediately after realizing the importance of different aspects of the game. Hansa Teutonica is basically a cube pusher that, to me, feels a bit like Endeavor. Each player has an individual “escritoire” divided into areas that depict the limits imposed upon the player when taking actions. It’s the player’s job to raise those limits through intelligent game play allowing more powerful actions in subsequent turns. As I mentioned, the game falls solidly in the cube pushing genre since your actions involve placing cubes on roadways that connect cities. By filling the roadway between two cities with only your cubes, you get the option of opening up an branch office in the city (placing a Kontor) or, depending on the city, removing a limitation from your escritoire. Where to place, move, or otherwise manipulate your cubes during your actions is up to you. There is player interaction since one action allows you to kick other cubes off a road that you want to occupy (at a cost to you and a benefit to the other player). There is a bit of randomness in the bonus markers that are randomly drawn and placed on three of the roads but during your turn, all information is known and visible. The game also features a somewhat inverted scoring mechanism. In many games you earn the bulk of your points during the game and at game end there may be some additional “end-game” points awarded depending on your final position, resources acquisitions, remaining money, etc. In Hansa Teutonica though, the end game is, in most cases, triggered by the first person to reach 20 points. However, that person is not necessarily the winner. Instead, most points are awarded after the game ends. This inversion of point allocation causes an interesting increase in tension as players get close to 20 points. At times, you may wish to make a particular set of moves but to do so you might trigger the end of the game so you must determine an alternate path to victory. At other times, you want to force the end game sooner so purposefully give other players points to drive them over the point limit. All in all, I like Hansa Teutonica but would not recommend it with three. There just doesn’t feel like there is enough conflict. I purposefully stayed away from much conflict and focused on lowering my privilege limits and then focused mostly on the lower left Privilegum track. Periodically I’d grab and extra action, place a Kontor, and of course, obtain more merchants but in generally tried to stay out of harms way and won handily. Of course, with two new players, the game may be much different on subsequent plays. While the dining room table finished up Cyclades, Jared and I played a game of Roll Through the Ages and a game of Ra the Dice Game. Thanks for coming guys. Some of us are heading down to walk the Origins Exhibit Hall on Friday (June 25) so if you happen to see me, stop by and introduce yourself. Got in games of Dice Town and Drive (three player) this weekend. Lisa and I had played Dice Town before but I finally got a chance to pull the shrink off my own copy and play it with my kids. Just so you know, the fun doesn’t begin until your own children start calling you names when you out-roll their 5 queens with your own set of 5 queens and you’re the sheriff! Oh…and mom’s don’t like it when dad’s have 5 queens. They don’t like it at all!